Ticket Includes: Mamma Mia 2, Drive In Karaoke & Popcorn! Mamma Mia 2 – Here We Go Again! – DRIVE IN MOVIE, our fantastic event being shown on our huge 36 foot screen and being held at Barleylands Craft Village and Farm Centre Car Park, Billericay, Essex CM11 2UD. 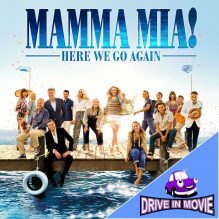 Get ready for the ultimate Drive-In movie experience, bring your family and sing along in your car to the classic songs of Abba and enjoy this great feel-good comedy with Meryl Streep, Cher, Amanda Seyfried and many more famous faces. Get all snug in your car, with great sound transmitted to your FM car radio. Your ticket includes a bag of popcorn. This promises to be a fantastic night of amazing Cinema with food. Great fun, bring the family and book it now!